Our Science & Data Interface (SDI) brings together key stakeholders to address significant issues in the ‘data supply chain’. We work in close collaboration with the industry, government agencies and other bodies to build innovative approaches to fisheries science and assessment. 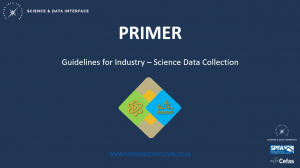 We aim to establish the protocols, partnerships and frameworks needed to ensure that fishermen collect the right data, at the right time, and in the right way; and that this data is then used to improve the management of their fishery. We promote the role of fishermen as professional stewards of the sea who gather data that: informs the performance and management of their fishery, contributes to long-term sustainability, helps minimise the impacts of the fishery on the wider marine environment. Fishermen need to know what data to collect, where and how if the information they generate is going to be able to inform fisheries management and policy.